Our assemblies are in every state of the union and overseas in areas where our military serve or have served. Assembly members are often also members of other patriotic and fraternal military service groups. Examples are: Veterans of Foreign Wars, Vietnam Veterans of America, Disabled Veterans of America, American Legion, Fleet Reserve and others. They know the importance of good citizenship, service to our country, and demonstration of our patriotism as Catholic Gentlemen. Raised well over $4,500 on Veterans Day 2012 for hospitalized amputees at Camp Lejeune and Ft. Bragg.. Visited and entertained hospitalized veterans in hospice and pallative care at the Durham VA Medical Center. Worked with UNC Chapel Hill to collect food for homeless veterans. Provided information to veterans and their families on VA medical care. Provided assistance to veterans with VA disability claims. 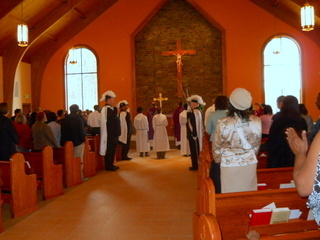 Provided funeral honors for deceased knights and area priests. Provide honor guards to St. Thomas More Church, as requested. Raised thousands of dollars passing out VFW Buddy Poppies to assist hospitalized veterans and fund in-hospital social events; restore a Carrboro veteran’s home and replace his roof, and assisted returning veterans in need. Assisted an injured and convalescing 92 year-old veteran with home repair needs and arranged for no-cost metal stairwell railings for his home exterior walkways. Led community parades in Rougemont, Timberlake, and Providence, North Carolina. Led the Caldwell, NC, July 4th Parade in full regalia for the last seven years. Raised funds for and obtained the Baptist Health Ministry mobile health and dental care centers for our local Spanish-speaking families. Personally funded programs, events, and services to ensure those in need were served. Promoted Good Citizenship in our Catholic and community schools. Provided household goods, food, services and transportation to brother knights and members of our church and community in need. Provided pig picking equipment, service, and personal time for church events, picnics, and fundraising. Served on church committees and led elements of our new church building campaigns, including design, construction and dedication. Served as leaders in local civic, professional, and military service organizations. This list goes on, and on, and on. In fact, their humility is such that many of their deeds go unrecorded. What they do is not about them. It has to do with service to others. Eighty plus men form our Divine Mercy Assembly. They are the leaders in our church. All will be life-long members of our Order. They are the very heart of the Knights of Columbus. There are 20 million new Catholics in America. I would like to think that our Knights of the Fourth Degree motivated quite a few converts through their selfless acts of faith. How about you? Why not consider joining these men? There is no better expression of service than to be a role model for your children and family. We’ll give you the opportunity to do great things for others.